Buckeye Valley’s Hannah Cowan, left, and Alaina Radcliffe trap Bloom-Carroll’s Haley Vollmer under the hoop in the first half of Friday’s Division II district championship game in Westerville. Fresh off his being named Central District Coach of the Year, Buckeye Valley girls basketball coach Travis Stout put Friday night’s 49-40 loss to Bloom-Carroll in the Division II district final at Westerville Central High School squarely on his shoulders. The seventh-seeded Bulldogs opened 6-0 and never trailed, using a 19-5 run in the first half to take control – extending the lead as high as 18. The sixth-seeded Barons just couldn’t find an answer for B-C post Chloe Davis, who scored 13 of her game-high 19 points in the first half to help the Bulldogs to a 32-17 lead at the break. The Barons had opportunities to stay in the game at the foul line, but converted just seven of 15 attempts in the first half and 10 of 21 overall. Davis scored a pair of baskets in a 6-0 start to the second half that pushed the lead as high as 38-19. That’s when the Barons found their footing with a 10-2 run to close the third. Reilly Taylor scored on consecutive possessions to get them started and Morgan Scowden turned her own steal into a layup in the final second of the frame. The Bulldogs (15-10) went into clock-mode in the fourth. They went the entire frame without a shot, but made enough free throws to keep the game out of reach. Davis and Makenzee Mason each knocked down a pair of free throws to push the Bulldog lead to 44-29. BV rallied with a basket by Dani Grether and three in three possessions by Hannah Cowan to get the Barons as close as seven. But, Mason converted three out of four free throws to account for the final margin. She finished with 15 points, going 13-for-16 at the charity stripe. 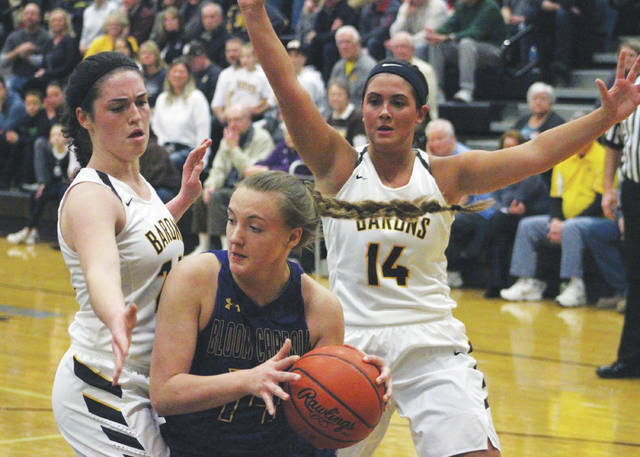 Alaina Radcliffe led with 10 points, Scowden and Cowan added nine apiece and Taylor chipped in six for the Barons (19-7), who made the district final for the first time since 1993. B-C moves on to the regional semifinal against No. 4 Tippecanoe Tuesday night at 8 p.m. at Springfield High School.